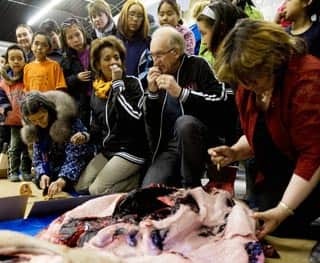 Food for Thought | Corporate Class Inc.
It’s been a month since Canada’s Governor-General Michaëlle Jean made international headlines when she ate raw seal heart, an Inuit delicacy, at a community banquet in Rankin Inlet, Nunavut. In this isolated, hunter-based society, food is traditionally shared with the entire community. Usually eaten frozen or raw – there is minimal fuel – seal meat is the principal food of the Inuit diet. As guest of honour, Governor-General Michaëlle Jean was offered the choicest morsels. Today, I stand by my convictions, but wonder if animal rights and the offence of eating the EU-banned seal meat were really at issue. Or, were they thinly veiled excuses for the act itself – of eating, directly, from a raw carcass? Was it the high-speed butchering and immediacy of consumption that offended modern sensibilities? No longer considered weird or distasteful, raw fish – served as sushi – is available everywhere. Ordinary supermarkets have special stands dedicated to its fresh preparation. Although not as ubiquitous as pizza, sushi is embraced as a wonderful, healthy, fast food. Past generations, without benefit of sushification, would have expressed abhorrence or revulsion at the very idea of eating raw fish. A food taboo, to put it mildly. We think of ourselves as open-minded and educated when it comes to the dinner table. Perhaps not gourmets, but tolerant—until one mentions the French penchant for horsemeat, or chicken feet at dim sum, or seal heart at an Inuit banquet. Every culture has a signature salutation – bowing, shaking hands, kissing – and its own dining rituals and recipes. Governor General Michaëlle Jean showed respect to the people of Rankin Inlet and that, ultimately, is what etiquette is about.